I was recently sent a Health + Ancestry Service kit from 23andMe to learn a bit more about my background and how it might affect my health. I sent in my sample, waited for a few weeks, and got my results back. I discuss my results, the types of reports, and my experience with 23andMe in the video above. I was sent this kit for free, but the thoughts and ideas are very much genuinely my own. I'd definitely recommend giving it a try if it's something that interests you as well! Let me know if you do try it for yourself in the comments below. Probiotics have become a pretty big buzzword these days and for good reason. So what’s the deal exactly? Probiotics are live microorganisms that, when taken in adequate amounts, help restore the balance of the flora in your gut which, when unbalanced, might cause digestive or other health-related issues. They keep things balanced and moving smoothly, helping you to live a happy, healthy life. You can’t really go wrong with that, so I decided to give one a try. I came across Florastor which is a bit different than other probiotics. It’s the only probiotic with Saccharomyces boulardii lyo CNCM I-745 which is a unique probiotic strain with 60 plus years of use and research. Some advantages that Florastor offers because of this are its ability to aid in the absorption of water and nutrients, break down carbs/fiber, and support a healthy immune. It can also be taken with ALL antibiotics since it is a yeast-based probiotic and not a bacterial probiotic. It’s also super convenient and easy to take. A number of probiotics need to be refrigerated, but Florastor uses a patented freeze-drying process to give it a three-year shelf, letting you skip the fridge. That makes it easy to take with you whether you’re traveling or just busy day to day. Florastor offers capsules and FlorastorMax which is a powder. I have no problem taking pills, so I opted to try the capsules. Plus you can even just pop open the capsule and pour the contents over some yogurt if taking capsules is an issue for you. It’s super easy and convenient either way! I’ve been taking the capsules for about a month now, and I’ve been feeling great. I’ve felt healthy and my digestion hasn’t been better! It’s also great because I never have to worry about missing it because I can literally pop the bottle in my bag and head out the door on a busy day since I don’t need to worry about keeping it refrigerated. I’d definitely recommend giving it a try if you’re looking to add a daily probiotic to your life. Locally, I know that it’s carried at Rite Aid, CVS, and Stop & Shop just to name a few. You can use the store locator over on their website to find a retailer near you. Let me know if you give it a try in the comments below! I’d love to hear you thoughts. So I just received my first Daily Goodie Box, and I can literally say within this first sentence that you should all go sign up RIGHT NOW. Like no joke. There are so many great quality goodies, and it's literally free. You sign up (no credit card required), they send you a box depending on availability, and you give feedback on the products inside. I'd try to get you guys a discount code, but no need because it's literally FREE (yes, shipping is included). Plus the products inside are legitimately great quality products and a cover a wide range. -Pipcorn - Delicious Mini Popcorn. I've had Pipcorn before and LOVE it, so it's definitely nice to see something I know and love in this box. -Gertrude Hawk - Peanut Butter Meltaway Bar. I haven't had this bar, but I know Gertrude Hawk, and that's some delicious, quality chocolate. -True Natural - Benecos Natural Beauty Lipgloss. I'm all about natural beauty products, so I loved seeing this certified natural, cruelty free, and gluten free lipgloss. -Bhatki - Yerba Maté Chai Artisan Tea. I love me some chai, and this one seems to have the best, straight-forward ingredients. -Miss Jones - Organic Cookie Mix. Organic sea salt chocolate chip cookies? Count me in! I'll be baking these as soon as I get this posted. -Elemental Herbs - All Good Organic Skin Food. I use coconut oil every day (like a lotion), so I'm super excited to try this GMO-free, vegan, and gluten free coconut oil. -Savant Naturals - Savi Crisp Chocolate Protein Bar. Can't wait to try these protein bars that are free of artificial sweeteners, colors, and flavors! -Wild Foods - Cocotropic, Chocolate Nootropic Drink. This powder sounds awesome! It contains reishi mushroom, raw maca powder, mucuna pruriens, and wild turmeric all helping to improve mental performance. You can sip it hot like hot cocoa or add it to smoothies, coffee, or other recipes. -RunGum - Energy Gum. Gum that's packed with B vitamins, caffeine, and taurine to help keep you energized and improve performance. I will definitely be giving this a try before my next workout. -Älsa - Energy Drink Mix. A healthy energy drink powder mix that's both vegan and gluten free. Another one to try pre-workout or just for that added boost of energy. I'm literally excited about every single product, and can't wait to give them all a try. Check each one out, and don't forget to head on over to Daily Goodie Box to subscribe and get a box of your own! Today is a very, very important day. 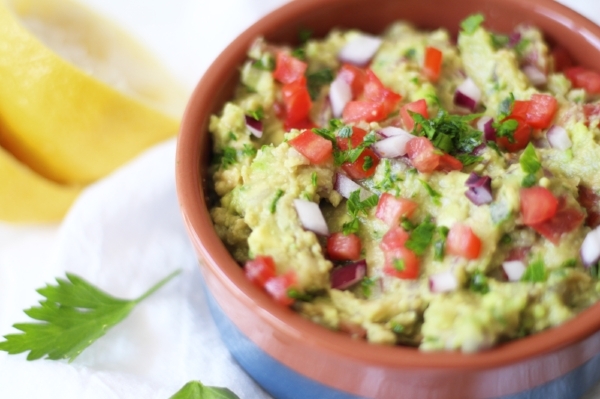 It's National Guacamole day! Yup, that's right, my favorite dip does in fact have its own holiday, and it's pretty well deserved if I do say so myself. There are few things better than that mashed avocado, and I'm pretty sure guac tastes good on everything! It's the perfect way to add some taste (and healthy fats) to your favorite dish or just eat straight up with chips or veggies to hold yourself over while you're cooking a main course. Use the code allroads for 3 free smoothies with your first order! You've probably seen me post about Daily Harvest over on Instagram, but in case you haven't, I'll give you a little rundown. You get to choose from 14 delicious smoothie flavors over on their website. These flavors range from Pineapple + Matcha to Mint + Cacao (my personal favorite at the moment). Every flavor combo is just SO good! You pick your flavors, and Daily Harvest ships them right to your door. You store the smoothies in your freezer until you're ready to use. When you want to make one you just add the liquid of your choosing (I generally go with unsweetened almond milk) and blend! You can also add any other ingredients you'd like i.e. protein powder, chia seeds, etc., but all you need besides the smoothie itself is the liquid of your choosing. You fill the cup to the top with liquid, toss everything into the blender until fully blended, and enjoy! The cup even comes with a lid if you want to just put the smoothie right back in and head out the door. When you open the cup, you might expect to find powder or something that once resembled spinach, but what you really find it real, whole, and identifiable food. You can see exactly what you're about to eat which is so important. The whole idea is just very transparent. The ingredients are right there in large lettering on the package, and they're real and identifiable ingredients. There aren't any weird fillers or crazy long ingredients lists. And you can match what's on that ingredient list to exactly what you see inside the cup. Besides, the amazing (and mostly organic) ingredients, is the added benefit of convenience. They're really just so easy and quick to make. Add liquid, blend, and you're done! They're perfect if you're rushing out the door in the morning or a busy mom with her hands full. With Daily Harvest you don't have to sacrifice quality, taste, or time. I also love that they have different smoothies designed for different things. They have Apple + Greens for detox, Cold Brew + Almond as an energizer, and Watermelon + Cucumber as a hydrator. You can customize your order to fit exactly what you want and need at the moment. And to be honest, I've yet to taste a flavor that isn't delicious! So would I recommend Daily Harvest? DUH! Go order them ASAP! But really, I highly suggest them. They're quick, easy, nutritious, and delicious. It really doesn't get better, you guys. Actually I lied, it does. Because you can use the code allroads for 3 FREE SMOOTHIES with your first order!